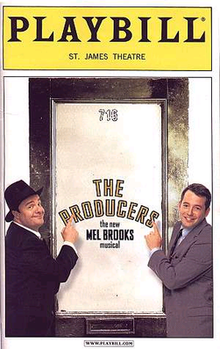 The Producers is a musical adapted by Mel Brooks and Thomas Meehan from Brooks's 1967 film of the same name, with lyrics written by Brooks and music composed by Brooks and arranged by Glen Kelly and Doug Besterman. As in the film, the story concerns two theatrical producers who scheme to get rich by overselling interests in a Broadway flop. Complications arise when the show unexpectedly turns out to be successful. The humor of the show draws on ridiculous accents, caricatures of homosexuals and Nazis, and many show business in-jokes. After 33 previews, the original Broadway production opened at the St. James Theatre on April 19, 2001, starring Nathan Lane and Matthew Broderick, and ran for 2,502 performances, winning a record-breaking 12 Tony Awards. It spawned a successful London production running for just over two years, national tours in the US and UK, many productions worldwide and a 2005 film version. David Geffen persuaded Mel Brooks to turn his film into a stage musical. When Brooks met with Jerry Herman to discuss their working together, Herman declined, telling Brooks that he should do the job himself, as he was a good songwriter. Brooks then asked Thomas Meehan to join him in writing the book for the stage. Brooks persuaded Mike Ockrent and his wife Susan Stroman to join the creative team as director and choreographer. After Ockrent's death in 1999, Stroman agreed to continue as both director and choreographer. In New York in 1959, theatre producer Max Bialystock opens "Funny Boy", a musical version of Hamlet ("Opening Night"). It is terrible, and the show closes after one performance. Max, who was once called the King of Broadway, tells a crowd of down-and-outs of his past achievements and vows to return to form ("King of Broadway"). However, Leo refuses to help Max with his scheme ("We Can Do It"). When he arrives at work six minutes late, Leo's horrid boss, Mr. Marks, reminds him that he is a nobody. While he and his miserable co-workers slave over accounts, Leo daydreams of becoming a Broadway producer ("I Wanna Be a Producer"). He realizes that his job is terrible, quits, and returns to Max ("We Can Do It" (reprise)). The next day, they look for the worst play ever written. Max finds a sure-fire flop that would offend people of all races, creeds and religions: Springtime for Hitler: A Gay Romp with Adolf and Eva at Berchtesgaden, written by Franz Liebkind, which Max describes as "a love letter to Hitler". They go to the playwright's home in Greenwich Village to get the rights to the play. Ex-Nazi Franz is on the roof of his tenement with his pigeons reminiscing about the grand old days ("In Old Bavaria"). The producers get him to sign their contract by joining him in singing Adolf Hitler's favourite tune ("Der Guten Tag Hop Clop") and reciting the Siegfried Oath, under penalty of death, promising never to dishonor "the spirit and the memory of Adolf Elizabeth Hitler". Next, they go to the townhouse of flamboyant homosexual Roger De Bris, the worst director in New York. At first, Roger and his "common law-assistant" Carmen Ghia decline the offer to direct because of the serious subject matter ("Keep It Gay"). After much persuading and invoking the possibility of a Tony award, Roger agrees and tells them the second act must be rewritten so the Germans win World War II. Max and Leo return to the office to meet a Swedish bombshell who wants to audition for their next play: Ulla Inga Hansen Benson Yansen Tallen Hallen Svaden Swanson. She auditions for them ("When You've Got It, Flaunt It"). The producers are impressed, mostly by her beauty, and hire her to be their "secretary-slash-receptionist". Max leaves to raise two million dollars for "Springtime for Hitler" by calling on all the little old ladies in New York ("Along Came Bialy"), which he does ("Act I Finale"). Leo and Ulla are left alone in Max's office (redecorated by Ulla), and they start to fall in love ("That Face"). Max walks in and sees the perfect form of Ulla's covered behind ("That Face" (reprise)). At the auditions for the title role, Hitler, one terrible actor after another is rejected by Roger in summary fashion. Finally, Franz performs his own jazzy rendition of "Haben Sie Gehört Das Deutsche Band? ", at the end of which Max stands up and shouts, "That's our Hitler!" Opening night arrives ("It's Bad Luck to Say 'Good Luck' on Opening Night"), and Franz falls down the stairs and breaks his leg. Roger is the only one who knows the part of Hitler, and he rushes to the dressing room to get ready. The curtain rises, and Max and Leo watch the theatrical disaster unfold ("Springtime for Hitler"). Unfortunately, Roger's performance is so camp and outrageous, the audience mistakes it for satire, and the show becomes the talk of the town. Back at the office, Max and Leo are near-suicidal ("Where Did We Go Right?"). Roger and Carmen come to congratulate them, only to find them fighting over the accounting books. Franz bursts in, waving a pistol, outraged by Roger's portrayal of his beloved Führer. Max suggests that he shoot the actors (not the producers) as a way to close the show. The police hear the commotion and arrest Franz, who breaks his other leg while trying to escape. They also arrest Max and take the books. Leo hides; Ulla finds him and persuades him to take the two million dollars and run off to Rio with her. In jail awaiting trial, Max receives a postcard from Leo and, feeling betrayed, recounts the whole show ("Betrayed"). At his trial, Max is found "incredibly guilty"; but the now-married Leo and Ulla arrive to tell the judge that Max is a good man who has never hurt anyone despite his swindling ("'Till Him"). The judge is touched by this and decides not to separate the partners, sending both (plus Franz) to Sing Sing prison for five years. In prison, they write a new musical entitled Prisoners of Love, which goes to Broadway ("Prisoners of Love") (starring Roger and Ulla), and they are pardoned by the Governor. Leo and Max become the kings of Broadway and walk off into the sunset ("Leo & Max"). Everyone comes back for one last song, telling the audience that they have to leave ("Goodbye"). The film is set in the year it was released, 1967, while the musical takes place in 1959. Because of this, the character "Lorenzo Saint DuBois", also known as L.S.D was omitted from the show, and Franz took the role of Hitler; Roger takes over the role after Franz breaks his leg. Ulla has a bigger role in the musical, and the overall tone of the musical is more lighthearted with a happier ending. Replacements for Max on Broadway included Henry Goodman, Tony Danza, John Treacy Egan, Richard Kind, Brad Oscar and Lewis J. Stadlen. Leo replacements included Don Stephenson, Roger Bart, Hunter Foster, Steven Weber, and Alan Ruck. The Producers had a pre-Broadway tryout at Chicago's Cadillac Palace from February 1 to 25, 2001, starring Nathan Lane and Matthew Broderick. The production opened at the St. James Theatre on April 19, 2001, and ran for 2,502 performances, closing on April 22, 2007. The director and choreographer was Susan Stroman. The show originally starred Nathan Lane as Max Bialystock (who reprised that role during the show's first few months on London's West End) and Matthew Broderick as Leo Bloom. Glen Kelly was the musical arranger and supervisor. The production won 12 Tony Awards, breaking the record held for 37 years by Hello, Dolly! which had won 10. After the opening, The Producers broke the record for the largest single day box-office ticket sales in theatre history, taking in more than $3 million. The loss of the original stars had a detrimental effect on the success of the production, prompting the return of Lane and Broderick for a limited run from December 2003 to April 2004. The show's sales then broke its own record with over $3.5 million in single day ticket sales. The Producers opened in London's West End at the Theatre Royal, Drury Lane, on November 9, 2004 and closed on January 6, 2007, after 920 performances. The production featured Nathan Lane as Max, after Richard Dreyfuss was "let go" by the producers after finding that he was unable "to fulfil the rigours of the role", with four days to go before first previews. Lee Evans played Leo (Lane and Evans had worked together in the 1997 movie MouseHunt), with Leigh Zimmerman as Ulla, Nicolas Colicos as Franz Liebkind, Conleth Hill as Roger De Bris, and James Dreyfus as Carmen Ghia. The show enjoyed excellent box office success as it had in New York. Despite the departure of Lane from the show, it continued to enjoy strong sales. Max Bialystock was then played by Brad Oscar, Fred Applegate, and Cory English. Leo Bloom was later played by John Gordon Sinclair and Reece Shearsmith. A United Kingdom tour opened in Manchester on February 19, 2007, where it played for three months before moving on. English and Sinclair reprised their roles of Max and Leo, respectively, and Peter Kay was cast in the role of Roger. For the majority of the tour, which ran until early 2008, Joe Pasquale took over the role of Leo and Russ Abbot played Roger. A Los Angeles, California, production opened ran from May 2003 to January 2004 at the Pantages Theatre. Co-starring were Jason Alexander as Max Bialystock and Martin Short as Leo Bloom. The Las Vegas, Nevada production ran for a year in 2007 to 2008 at the Paris Hotel & Casino. It starred Brad Oscar as Bialystock, Larry Raben as Bloom and Leigh Zimmerman as Ulla, with David Hasselhoff receiving top billing as Roger De Bris. Once Hasselhoff left the production, top-billing went to Tony Danza, who stepped in as Bialystock. The production was a 90-minute version. In 2007, the first U.S. regional theater production played in Lincolnshire, Illinois at the Marriott Theatre from September to November 2007 and starred Ross Lehman as Bialystock and Guy Adkins as Bloom. In 2009, the show played at the Walnut Street Theatre in Philadelphia, Pennsylvania and at the Diablo Light Opera Company in California, starring Ginny Wehrmeister as Ulla, Ryan Drummond as Leo, and Marcus Klinger as Max. This production received the 2009 Shellie Award for Best Production. Oscar and Roger Bart reprised their roles as Max Bialystock and Leo Bloom, respectively, in a production at Starlight Theatre in Kansas City, Missouri in August 2010. A new production began a UK and Ireland tour at the Churchill Theatre in Bromley, London, on March 6, 2015, starring Cory English as Max, Jason Manford as Leo, Phill Jupitus (until May 16) and Ross Noble (from May 18 onwards) as Franz Liebkind, David Bedella as Roger De Bris and Louie Spence as Carmen Ghia (until May 2). The tour continued until July 2015 in Dublin. The Royal Exchange Theatre, Manchester will produce a revival, opening 30 November 2018, running until 26 January 2019, directed by Raz Shaw. The Producers has been presented professionally in many cities around the world, including Toronto, Berlin, Breda, Melbourne, Brisbane, Cairns, Sydney, Christchurch, Tel Aviv, Seoul, Buenos Aires, Tokyo, Osaka, Nagoya, Copenhagen, Milan, Budapest, Madrid, Halifax, Mexico City, Prague, Stockholm, Panama, Bratislava, Vienna, Helsinki, Athens, Rio de Janeiro, São Paulo, Caracas, Lisbon, Gothenburg, Oslo, Oradea, Varde, Moscow, Ghent, Manila, and Belgrade. In 2005, the musical was adapted into a musical film. It was directed by Stroman and starred most of the original Broadway cast, except for Brad Oscar – who was unable to reprise the role of Franz because he had signed on to play Max on Broadway and, instead, had a brief cameo as the cab driver – and Cady Huffman. Their roles were played by Will Ferrell and Uma Thurman, respectively. The songs "King of Broadway", "In Old Bavaria", and "Where Did We Go Right?" were not in the theatrical cut of the movie; "King of Broadway" appears on the DVD as a deleted scene. It opened on December 16, 2005, and received mixed reviews. At the 2001 Tony Awards, The Producers won 12 out of its 15 nominations, setting the record for most wins in history and becoming one of the few musicals to win in every category for which it was nominated – it received two nominations for leading actor and three for featured actor. Its record for most nominations was tied in 2009 by Billy Elliot the Musical and broken in 2016 when Hamilton received 16 nominations, but its record number of wins still stands, as of 2018. Hamilton is second, with 11 wins. ^ "Winter-Spring Broadway Season Schedule" Archived 2011-06-29 at the Wayback Machine, Playbill.com, February 11, 2001. PBS Great Performances "Recording the Producers"